Editorial: A Role for Improved Nutrition in Periodontal Management Strategies? Beikler, Thomas / Flemmig, Thomas F.
The decision to retain a tooth or to place an implant should be based on the probability of longterm success of one or other of the treatment modalities. However, the periodontological and implantological studies published on this subject only allow a limited direct comparison because of the heterogeneous definition of treatment success. From a clinical point of view, it makes sense to adopt a method in which five periodontal prognostic categories (very good, good, fair, poor and hopeless) are established, based on a combination of various parameters (e.g. attachment loss, furcation involvement, mobility). Teeth with a 'fair' prognosis or better can be treated by periodontal therapy and maintenance in the long term, with a high probability of success. For teeth with a 'poor' prognosis (50% to 75% attachment loss and/or inaccessible class II furcation involvement, class III furcation involvement and/or mobility class II), however, the recommendation is extraction and replacement with implants, when prosthetic anchorage is needed at the site. As a rule, extraction is the treatment of choice for teeth with a hopeless prognosis. Generally accepted guidelines on the definition of treatment success are required, so that the results of alternative treatment modalities can be compared directly and the treatment outcome rendered more predictable. Criteria for the Selection of Root Coverage Procedures. The variety of root coverage procedures, the variability of recession anatomy, including the adjoining tissues, high expectations of aesthetically demanding patients and the elective nature of the surgical procedure pose great challenges with regard to therapeutically establishing the indication as well as risk assessment of the planned intervention. The aim of this review is to reveal and evaluate crucial factors that enable the clinician to select the most suitable procedure. It is known that the proportion of older adults in the UK population is increasing, life expectancy is increasing and that edentulism is declining. This means that there will be increasing demand for periodontal treatment from elderly patients and it is incumbent on the dental profession to ensure that their particular and growing needs are addressed. 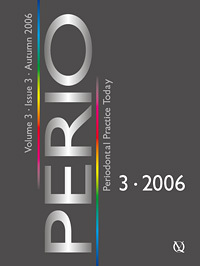 The role of age per se in the development and progression of periodontal disease is considered. The main part of the present paper presents a framework for providing such care, emphasising the need for producing individually tailored and adaptive management strategies that cope with particular and changing patient circumstances. The fundamental objective is the preservation of a functional and comfortable dentition and the key to success is setting realistic goals of periodontal therapy. A five-stage approach to treatment is advocated, although the specific therapy undertaken must be individually judged and implemented depending upon the particular circumstances. The potential clinical findings at the re-examination stage after completion of cause-related therapy are considered and there is specific emphasis on management strategies to cope with different treatment outcomes. Hayes, Mairéad / Tomson, Phillip / Parmar, Satyesh / Chapple, Iain L. C.
Proliferative verrucous leuoplakia (PVL) is widely accepted as an aggressive variant of oral leukoplakia, which tends to manifest itself as a longstanding, persistent leukoplakia that is typically resistant to treatment. Although the aetiology of PVL is unknown, the potential for recurrence and malignant transformation is such that treatment of this lesion requires an aggressive approach. Even with this approach, reports suggest that affected patients are at risk of developing verrucous or oral squamous cell carcinoma during episodes of recalcitrant disease. This report describes the clinical presentation of a patient with PVL. It outlines the difficulties in treatment planning for patients with the condition and discusses the long-term implications of such a diagnosis. Saha, Shuva / Gopakumar, Ashish / Chapple, Iain L. C.
This clinical report presents a case of a lateral periodontal cyst of odontogenic rather than inflammatory origin, and illustrates its successful management using Emdogain® as a means of regenerating a viable periodontal attachment prior to osseous infill of the resulting cyst cavity. Lateral periodontal cysts are relatively rare, slow-growing developmental cysts, typically associated with vital teeth. Management usually involves enucleation and bone-cavity healing by secondary intention, but care must be taken during surgery to avoid root surface damage and subsequent root resorption. The presented case illustrates the diagnostic pathway for lateral periodontal cysts and the radiological and clinical outcomes following the use of Emdogain® to encourage periodontal regeneration. A careful step-wise approach is needed to enable accurate diagnosis and to facilitate surgical treatment planning. Roberts, A. / Laird, W. R. E. / Murphy, P. / Chapple, I. L. C.
This manuscript is a technical report to illustrate the pre-prosthetic surgical planning of a case of gingival angioedema, where substantial soft tissue removal was anticipated at the time of surgery and the periodontal-restorative team wished to provide predictable and good quality denture-bearing tissues to facilitate the insertion of an immediate maxillary prosthesis. A surgical model was created and a mock surgical procedure performed, providing the laboratory technician with a close representation of the planned outcome, on which to fabricate the immediate prosthesis. The clinical planning and technical procedures are illustrated and the definitive surgery documented in a step-wise manner, to allow visualisation of the overall case management from pre-surgical planning up to completion of surgery.